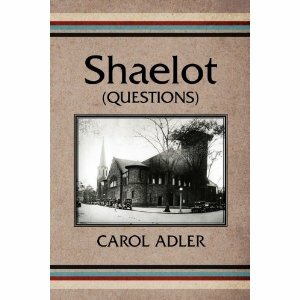 Shaelot-Questions,by Carol Adler, is a collection of poems written over the span of five decades. Most of the poems are sourced from Adler’s personal experiences. “I cannot deny that “my Judaism” shaped me and is still as much a part of my creative life as on that day at age four when I managed to pry open one of the heavy wooden doors of the former Gibbs Street Temple B’rith Kodesh sanctuary in Rochester, New York,” writes Adler in the book’s lengthy introduction. “As I peered into the dimness—as I gazed at the ornate, strange looking curtained “house” on the raised platform in front, something stirred deep inside that until that moment I knew nothing about. In Shaelot-Questions, Adler digs deep inside her own mind and heart and delivers, in the spirit of the Prophets of Israel, her own self-styled “Howl” directed toward Jews and and non-Jews alike. Carol Adler’s publications include three novels, four books of poetry, and well over 200 poems in literary journals; including most of the major Jewish magazines and newspapers that publish poetry. She has ghostwritten over 40 non-fiction and fiction works for a number of professionals in the education, health care and human potential industries.